With a stay at Baia Bursa Hotel, you'll be centrally located in Bursa, within a 10-minute drive of Buttim Bursa International Textile Trade Center and Bursa Zoo. 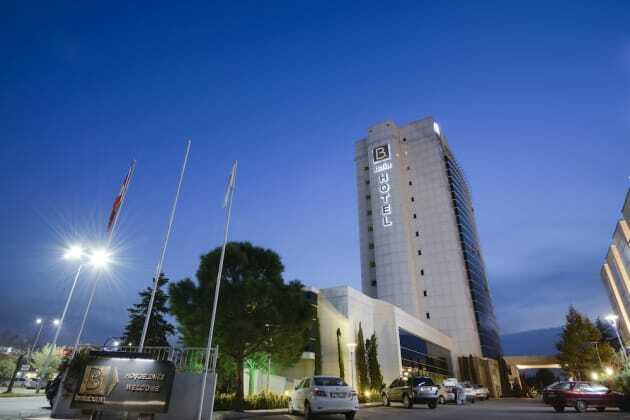 This 5-star hotel is 13.8 mi (22.2 km) from Uludag University and 26.2 mi (42.1 km) from Uludag Ski Center. Relax at the full-service spa, where you can enjoy massages and body treatments. This hotel also features complimentary wireless Internet access, concierge services, and babysitting/childcare (surcharge). A stay at Almira Hotel Thermal Spa & Convention Center places you in the heart of Bursa, a 1-minute drive from Merinos Cultural Park and 7 minutes from Bursa Culture Park Open Air Theatre. This 5-star hotel is 10.6 mi (17.1 km) from Uludag University and 21.5 mi (34.6 km) from Uludag Ski Center. A stay at Kervansaray Thermal-Convention Center & Spa places you in the heart of Bursa, a 5-minute drive from Timsah Arena and 6 minutes from Bursa Culture Park Open Air Theatre. This 5-star hotel is 9.3 mi (14.9 km) from Uludag University and 20.2 mi (32.6 km) from Uludag Ski Center. Featured amenities include a computer station, express check-in, and complimentary newspapers in the lobby. Free valet parking is available onsite. Make yourself at home in one of the 171 air-conditioned rooms featuring fireplaces and flat-screen televisions. Complimentary wired and wireless Internet access keeps you connected, and cable programming provides entertainment. Conveniences include phones, as well as laptop-compatible safes and desks.